Some might say that Eclipse is too powerful and has too many features. But to me, the many small and somehow hidden gems can make a big difference in my daily life. One of these features is ‘Step Into Selection’ while debugging. I would like to step into the outer function FAT1_CheckCardPresence(), but when I do a ‘step-into’, it will first step into the CLS1_GetStdio() function. So there I have to do a ‘step-out’, and if there are multiple inner (nested) function calls, this requires many ‘step-into’ and ‘step-out’ clicks and operations. For nested function calls, I do not need to step-into all the nested functions: I can use ‘Step Into Selection’ feature instead. This saves me many steps and clicks every day :-). This entry was posted in Debugging, Eclipse, Embedded, Tips & Tricks and tagged Debugging, Eclipse, technology, Tips&Tricks by Erich Styger. Bookmark the permalink. It’s “better” to factor out the code into multiple lines, so it is (a) easier to understand, and (b) easier to debug. The code will very likely be optimised to the exact same output, so performance is not an issue. Agreed, that’s sometimes an option. But that might not be economical if that code is not maintained by me. On the other side the tools have to deal with the coding style and should not force us to program for the tools. Seems to me that only Ctrl is needed? That might depend if you have different shortcuts assigned (I’m referring to standard Kinetis Design Studio v3.0.0). CTRL alone enables ‘hyperlink’ mode, that means that it underlines the text, but if you click on it (with CTRL), then the *editor* jumps to that location. To have the *debugger* jumping (stepping into selection) that location, I have to use CTRL+ALT. 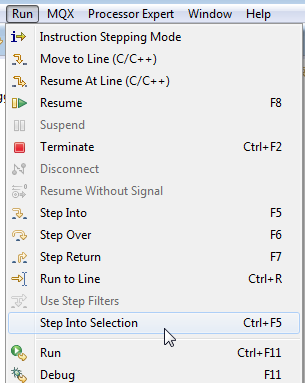 I believe on your end it is the editor function you see (like F3, or ‘Open Declaration), but not ‘step into selection’? Ah – OK – sorry. I just saw the hyperlink underlining with Ctrl but didn’t check what happened when I clicked on it during a debug session. And I’m using “standard” Eclipse/CDT (Luna) etc. so maybe that’s different to KDS.